Took this one while in the Harriot Island playground area. I was watching my kids play here, I turned around and the a-frame was nearly aligned with the 1st National Bank building. Strange inspiration for taking a photo eh? There was this massive cloud bank to the east on Saturday. I had to take a photo of it. I also wasn't alone. 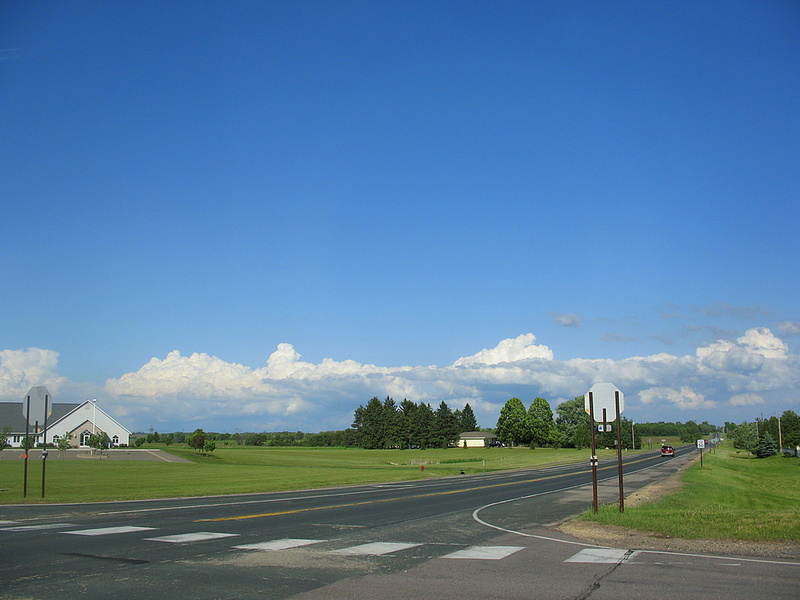 Head over to St Paul Daily Photo by Carol for a different view of the very same cloud bank! It really was impressive as the east had the beautiful clouds in the photo, while the rest of the entire sky was completely cloudless and full of blue. I had to drive around for a bit to get rid of the house and trees to get a clear view of the sky. I'm going to keep with the concert series theme since it's Memorial Day weekend. I've had this photo in my photo vault for well over a year now. 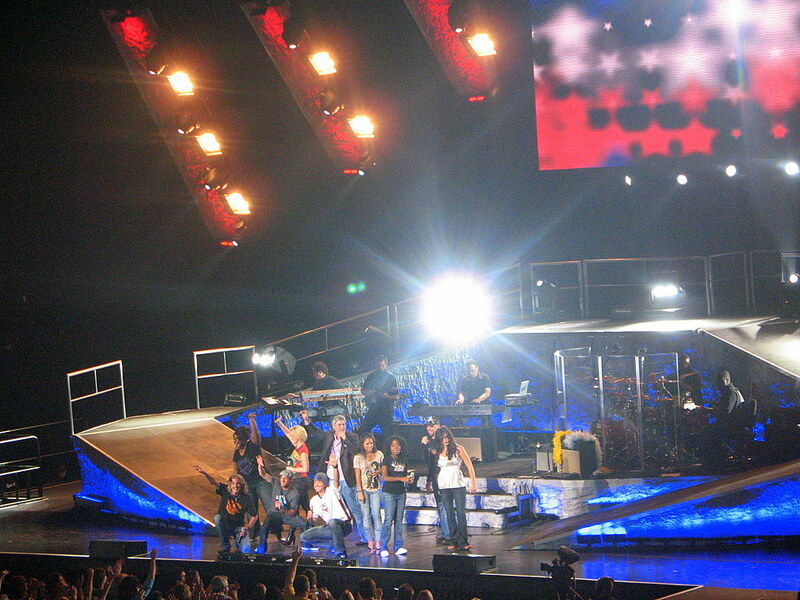 I took this one during the Kid Rock concert back in April of 2006 when they performed in St Paul at the Xcel energy center. Wifey and I were sitting in row 14, center section. I challenge you to find anyone who enjoys a concert of this music genera and also enjoys concerts that features nothing but brass instruments as show in the previous daily photo. The photos I took during the show were very tough to take. Low light, no tripod, lots of movement. Needless to say, most of the photos were a blur and not very presentable. This one was fairly decent with the pyrotechnics in the background giving me more light for this photo. 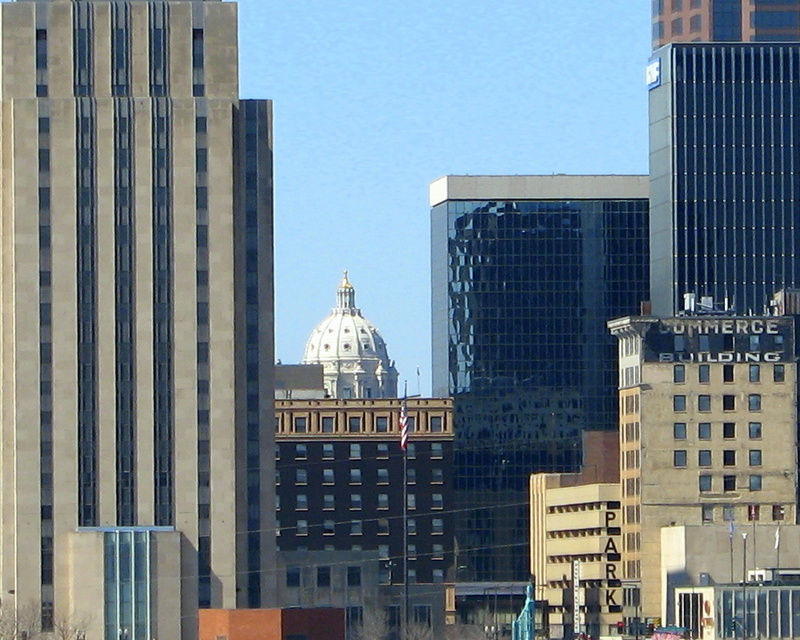 This past spring, I attended a brass quintet concert in the northern part of the Twin Cities. I brought my wife and two kids to see Classic Brass Inc. The word on the street is they are one of the busier brass quintets in the Twin Cities area. Their repertoire is quite varied and they also throw in a money-back guarantee, what a deal! I've grown up watching two of the members of Classic Brass Inc playing various types brass instruments since the early to mid 80's. 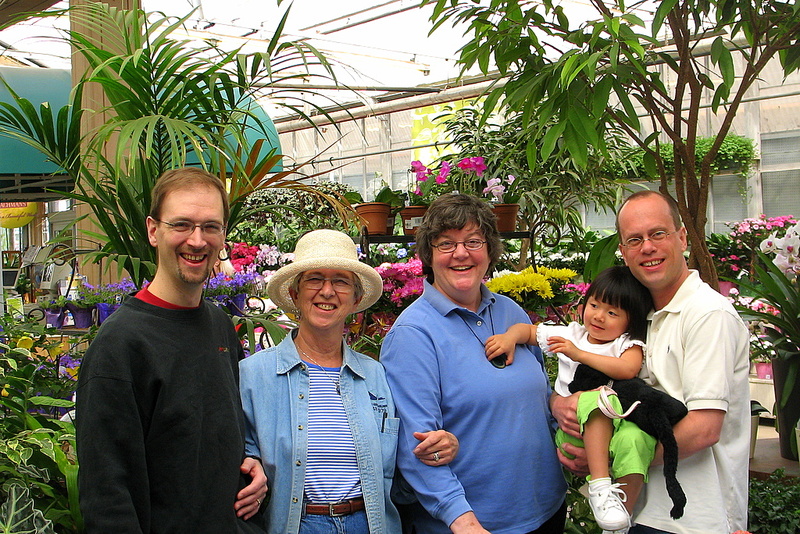 My Uncle Roger and Aunt Tina, the two in the photo on the far right. I first saw them perform with Minnesota Brass Drum & Bugle Corps at many Drum and Beauty Competitions and have always enjoyed the shows. Classic Brass Inc has a few summer concerts on their schedule. The June events I have prior events already scheduled, but the August 27 concert in Minneapolis at Lake Harriot Bandshell, I have marked on my calendar to attend. My son and I were heading back home one Saturday and we pass this Jim Beam sponsored racing car driving on the streets of Cottage Grove. He squealed the tires a bit as he turned the corner. I had to see where it was going. I did a u-turn and the next available spot and went on a chase. I saw the parking lot it drove into and read the sign that said the car was on tour at a new local liquor store, how ironic. Interesting way to advertise I though. My son asked if I had the camera because he wanted to take a photo for this website. So this is his first photo he took for the Twin Cities Daily Photo. The car was only there from 4:00 to 6:00 and it was 6:07 at the time of this photo. They actually were rolling the car onto the trailer for the day, otherwise he would have gotten a better shot from outside the car. Last photo from the Carpenter Nature Center. This great horned owl was impressive to me. 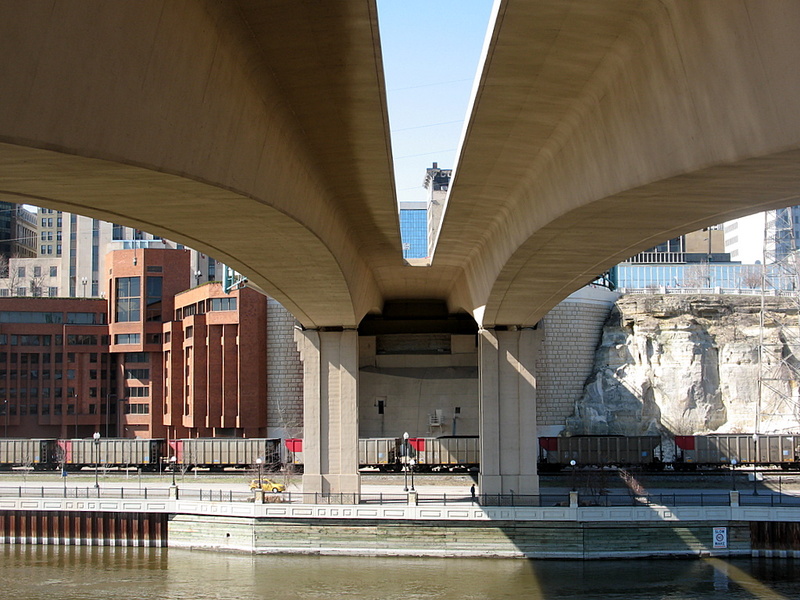 Mainly because I heard them a lot when I lived in St Paul, but never ever saw one. Living out in Cottage Grove, that is one thing I do not hear that often. So to finally see one, wow, larger than I expected. Another photo from yesterday's Carpenter Nature Center. One thing I never realized about the bald eagle....I was very surprised to see feathers covering it's legs. It actually looked strange seeing all of the feathers. 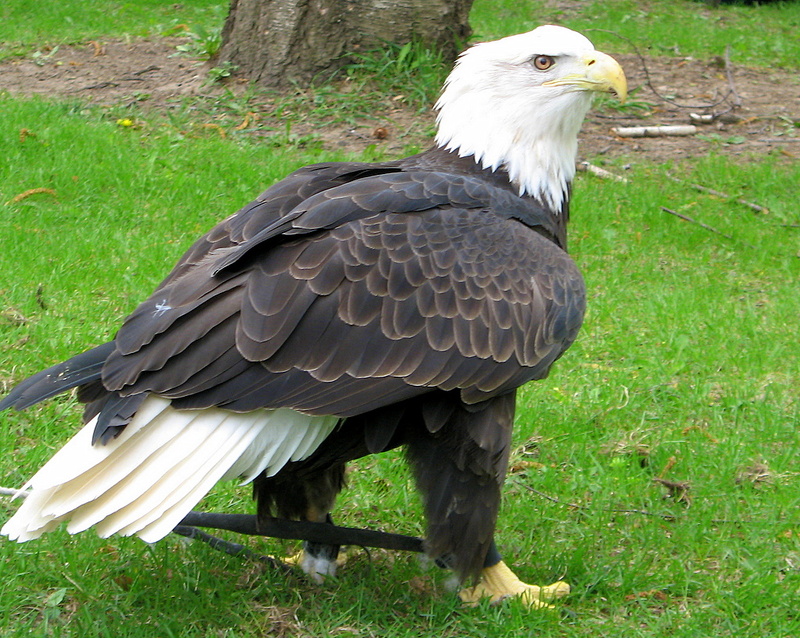 Most birds legs are exposed to the elements, but the bald eagles legs were covered with feathers. Perhaps being such large birds with large feathers, one can actually notice their legs. My guess is the extra covering helps the eagles who do not migrate. Not all of them do, which I was also not aware of. When I was awaiting the raptor release, I observed nine bald eagles flying in the sky. I had never seen so many eagles flying at once in the sky. It was quite a sight to see. 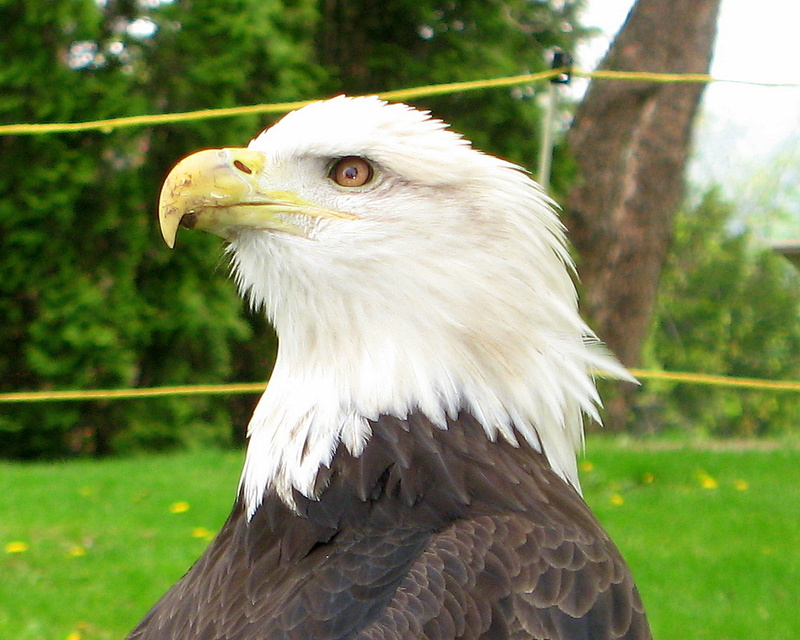 I know a lot of the bald eagles success comes from the Carpenter Nature Center. I wonder just how many of these beautiful birds call this area home. 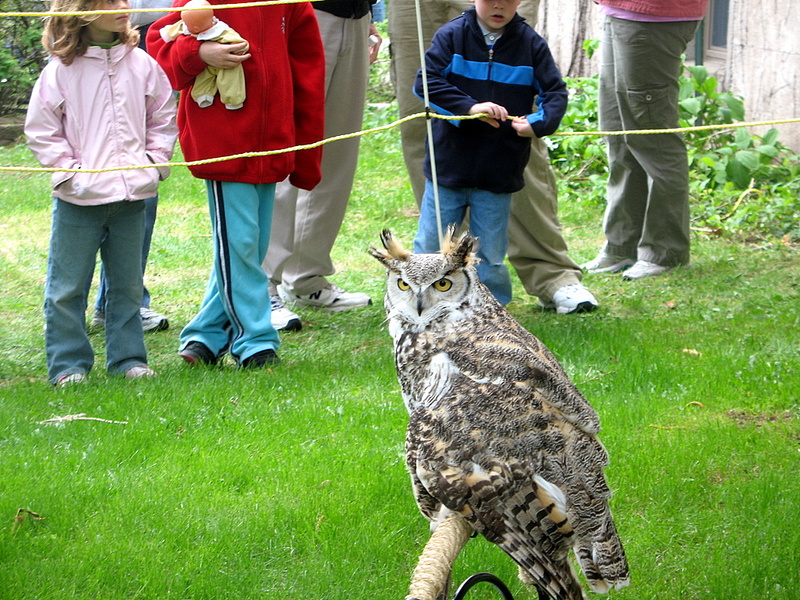 Made a visit to Carpenter Nature Center for their annual raptor release event. 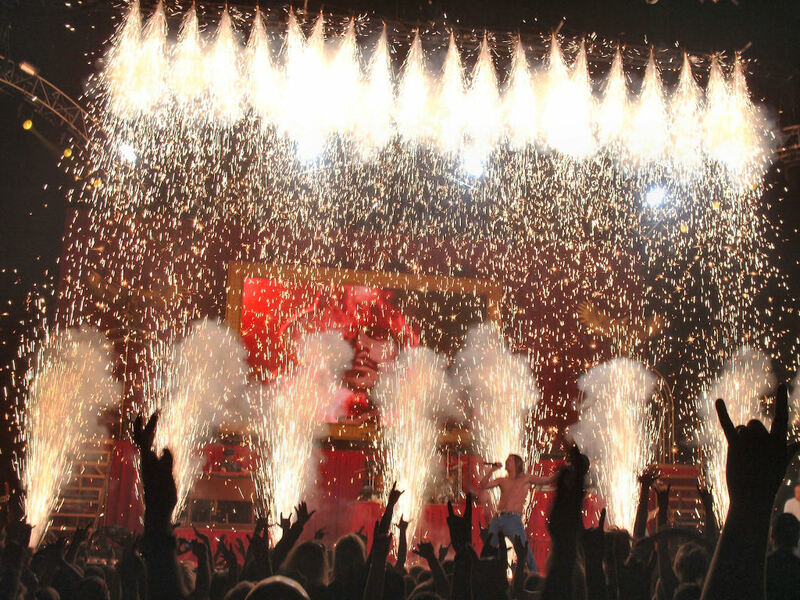 It certainly was amazing to see if you've never been to an event like this before. They released four birds on this day. One bald eagle, two red tail hawks and I cannot recall the fourth bird they released. This was the first time I had been to this type of event and had no idea that a place like this existed. 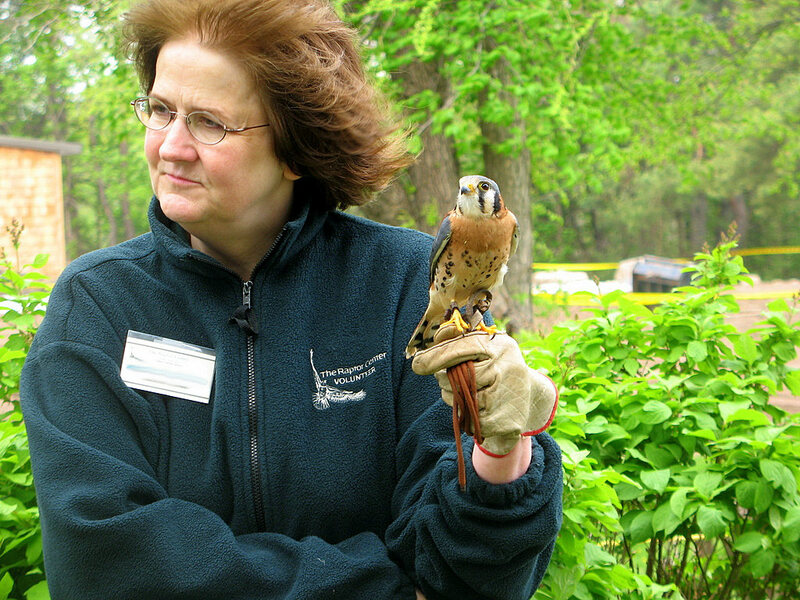 The short story, they help injured birds of prey back into the wild. They come in to the center for various reasons, broken wing, the bird was caught in a live trap and had a broken leg, etc. To see these birds up close like this was awe inspiring. Today's photo is of a bald eagle that had been injured in some way, but could never be released back into the wild for fear of it not surviving if it was released. Some of the birds just are not able to be healthy enough to make it. 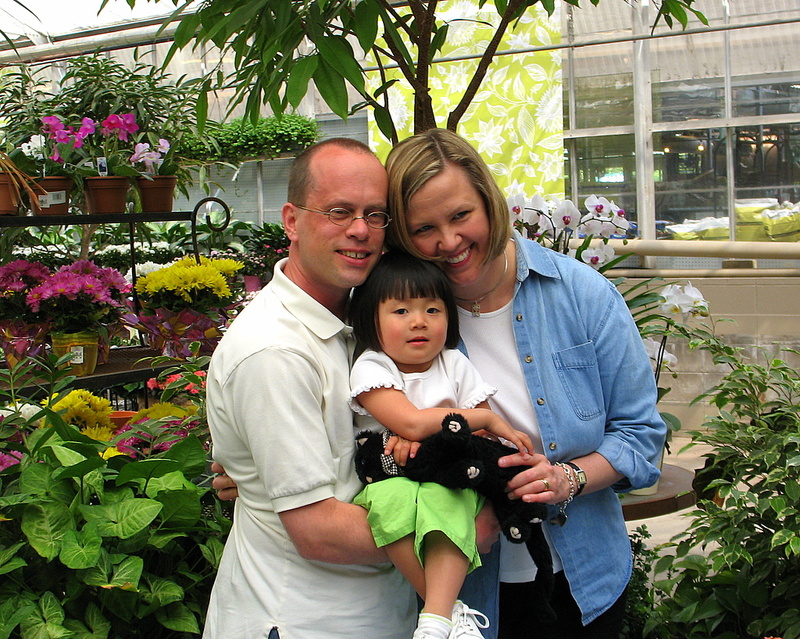 The center is run by donations from public and private charities. All of the workers are volunteers, which again is quite amazing in this day and age. I took this photo back in, I believe it was the end of February, perhaps early March. Took this through one of my windows in my kitchen. I really like how this turned out with the sun shining through the clear ice with the neighborhood as the back drop. 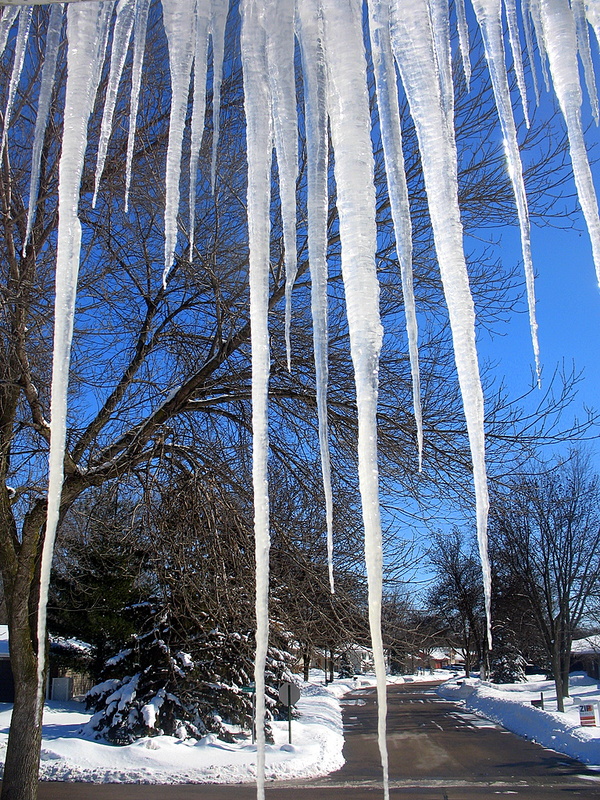 The longest icicles were roughly three and a half to four foot long from the overhang of the roof. 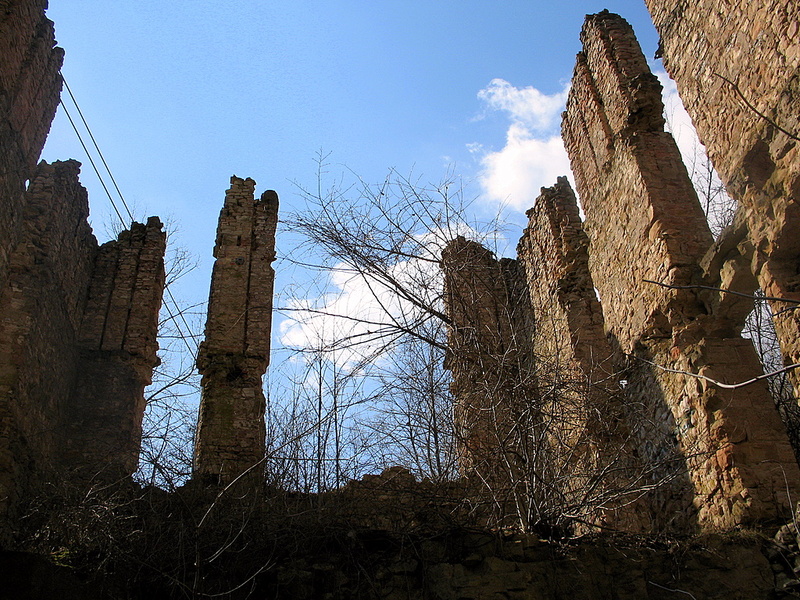 Hats off to Tara of Baton Rouge Daily Photo for correctly guessing the ancient ruins discovered in the Twim Cities were of a mill of some kind. Indeed, these are the remains of one of Hastings first flour mills. 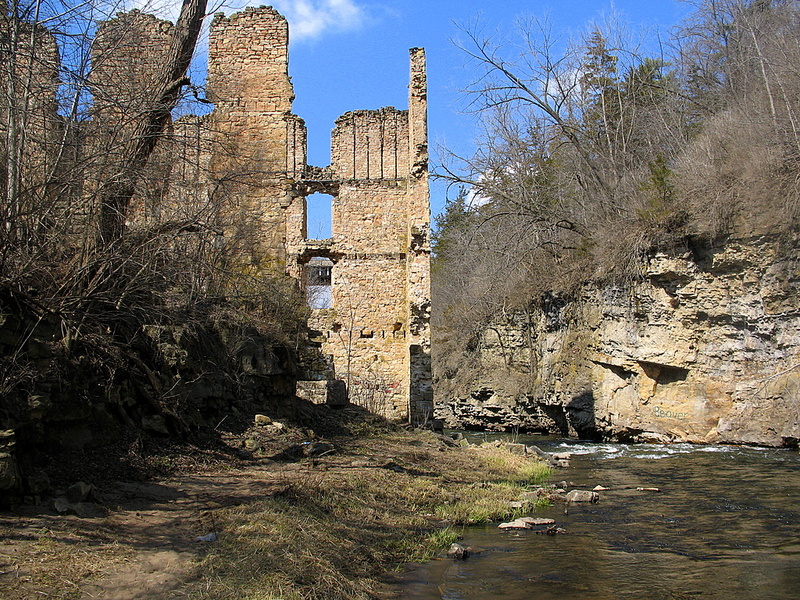 This is the Ramsey Mill, built in 1857 by Governor Alexander Ramsey [construction was started in 1855].It burned down in a fire on December 22, 1894. The mill was rather small and produced about 100 barrels of flour a day. 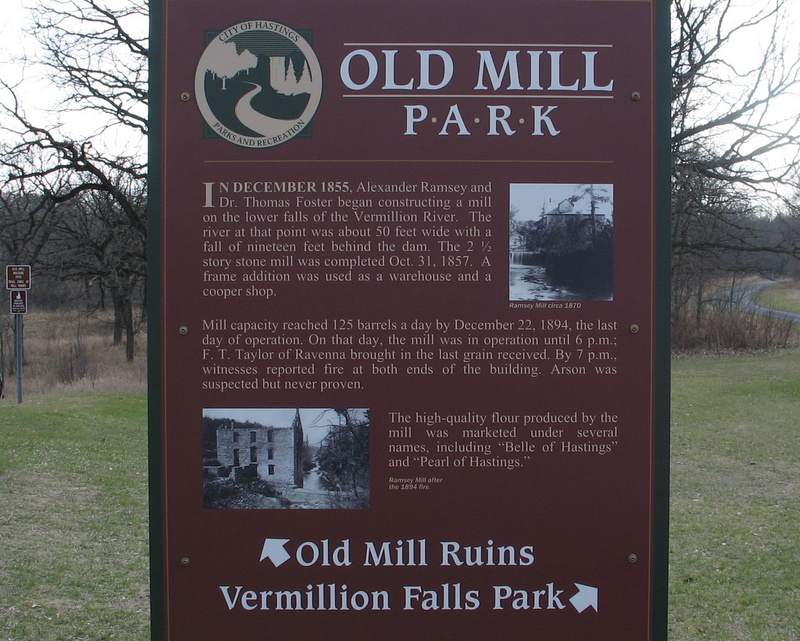 Gardner Mill, located on the Vermillion Falls produced about 1000 barrels of flour per day. I've featured the Gardner Mill, now called the Hastings Flour Mill, as a past Daily Photo. 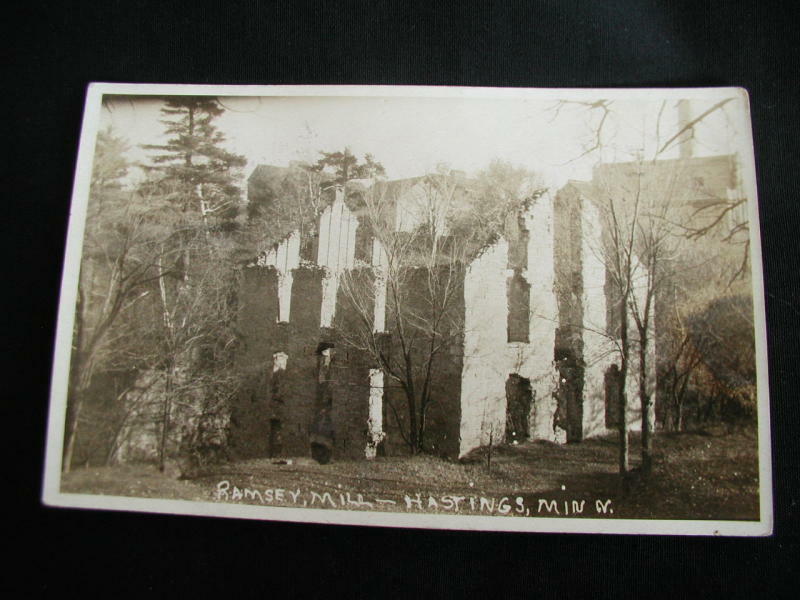 I found this photo of the Ramsey Mill taken in 1930. Photographer is unknown. Delta, Colorado - another WOW! 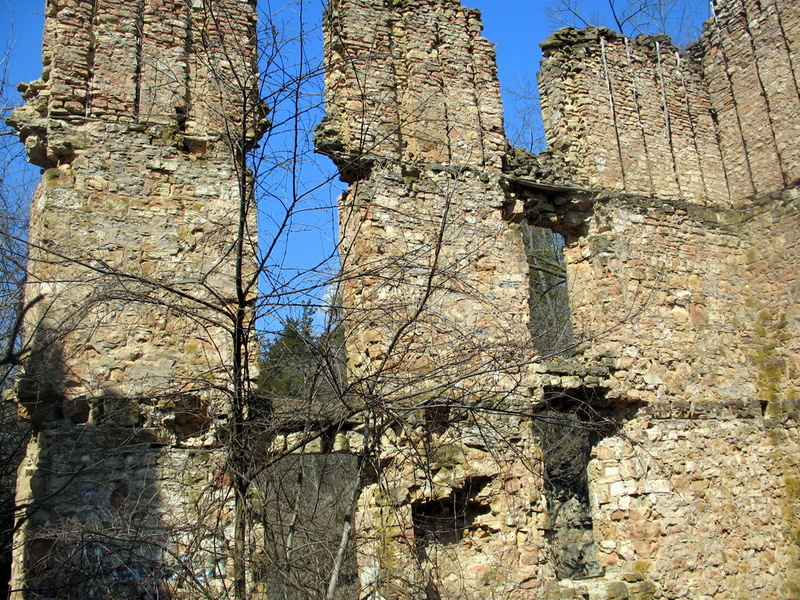 I wanted to continue on with the ruins of a building I found while on a walk with my wife and kids. Standing back to give you a bigger perspective on the area the building is sitting in. 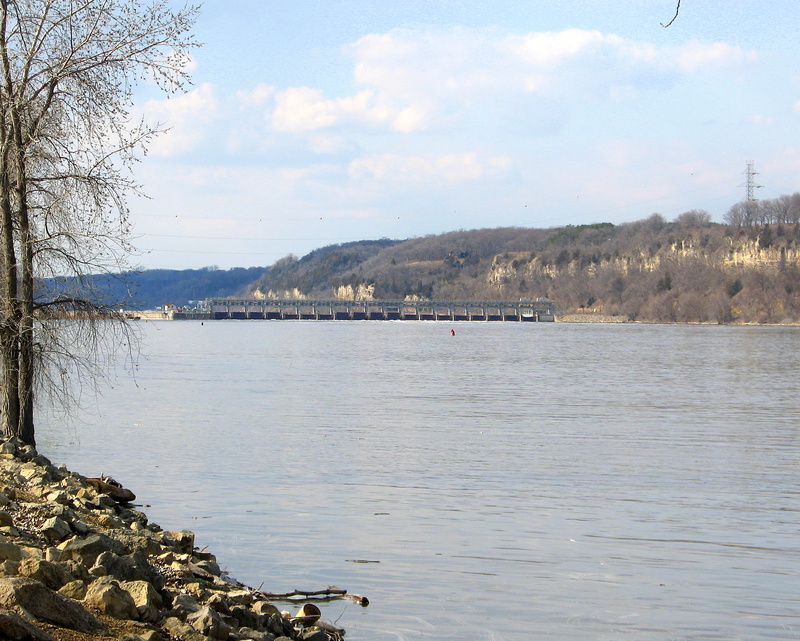 I mentioned a river it was built along, this river is in Hastings and empties into the Mississippi River not too far from here. I recall a comment a couple posts ago about how could they let the building stand in fear it will fall on someone. I can honestly say, that thought had crossed my mind when I was standing inside of the building remains. I would like to return to this site when the sun is nearly setting and the river waters have warmed up a bit more. Looking back on the first two photos of this site, the sun setting with a reddish tint in the sky, standing in the water on the other side of the river bank near the beaver! Did you see that beaver over there on the east side of the bank? Throw in a bit of river water reflection. I can picture the shot in my mind, but I need to be there at the right time and I do need a replacement camera. I brought my broken camera along to the Breakfast Club gathering and described what I did to break the LCD screen. Tomorrow I will give all of the details on this site that I can find. Another angle of the ancient ruins. 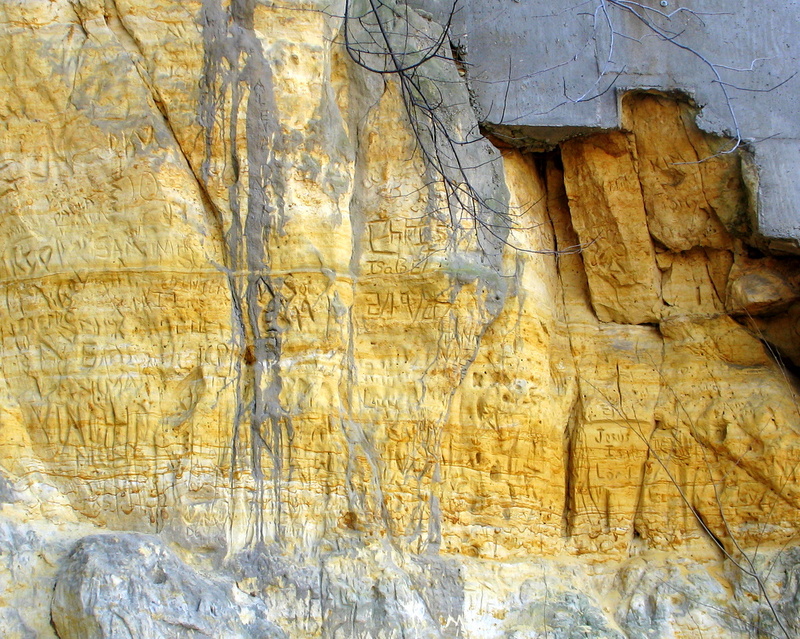 From walking around the old building, the horizontal lines in the stone is where the floors were located. The open areas were windows at one time. The vertical lines of wood, I believe it was wood, I'm guessing it was to help support the roof when it was there. 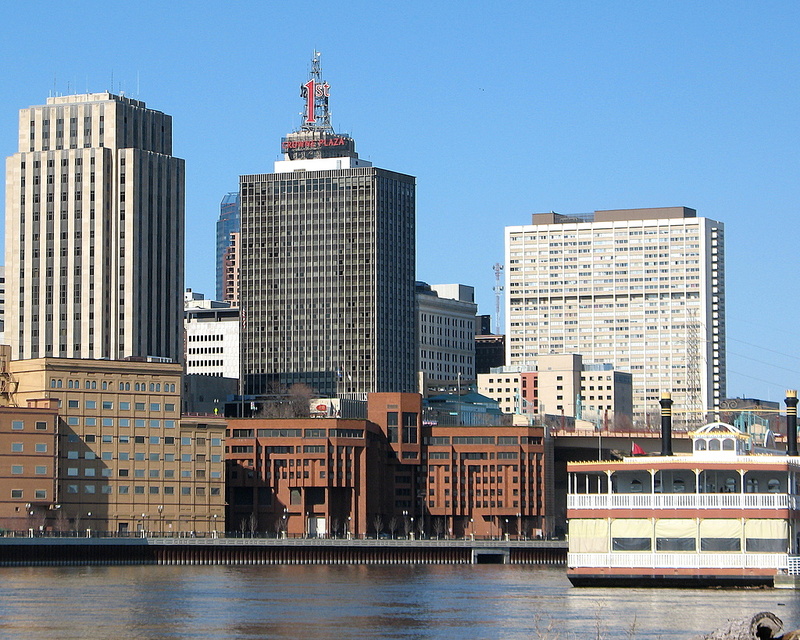 The building location is located along side a not so well known river. Ancient Ruins? 1885 this building was built. Does over 100 years count as ancient? That's debatable for sure. 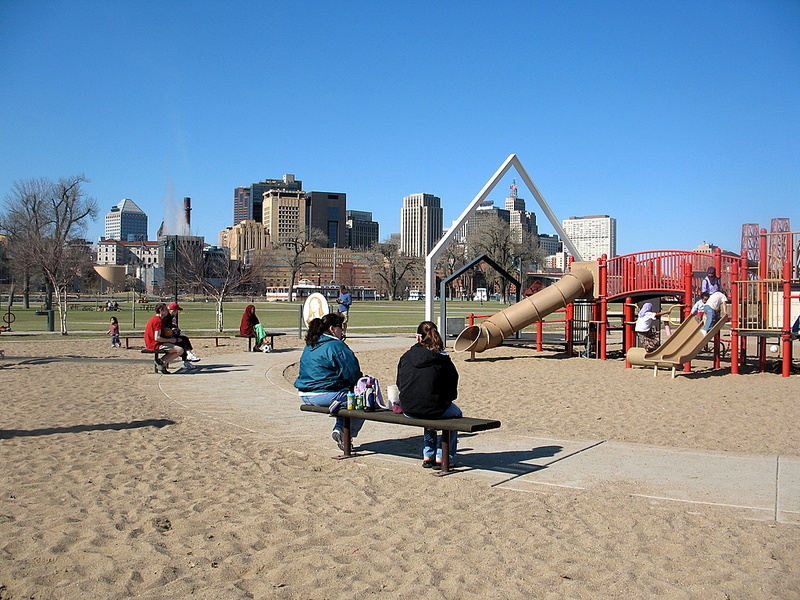 So what and where is this place in the Twin Cities....Especially you locals who are familiar with the area. I can assure you, it is in the Twin Cities metro area. I discovered in using one of the photo areal sites, local.live.com. I was looking at a particular place from the satellite view when I discovered this odd shaped remains of a building. If you think this photo looks mysterious in this photo, try looking from a satellite image and try to figure that out. As I wasn't sure exactly what I was looking at....There it was, I had a mission, I had a quest, I had to discover it for myself....I will let you discover it with me. 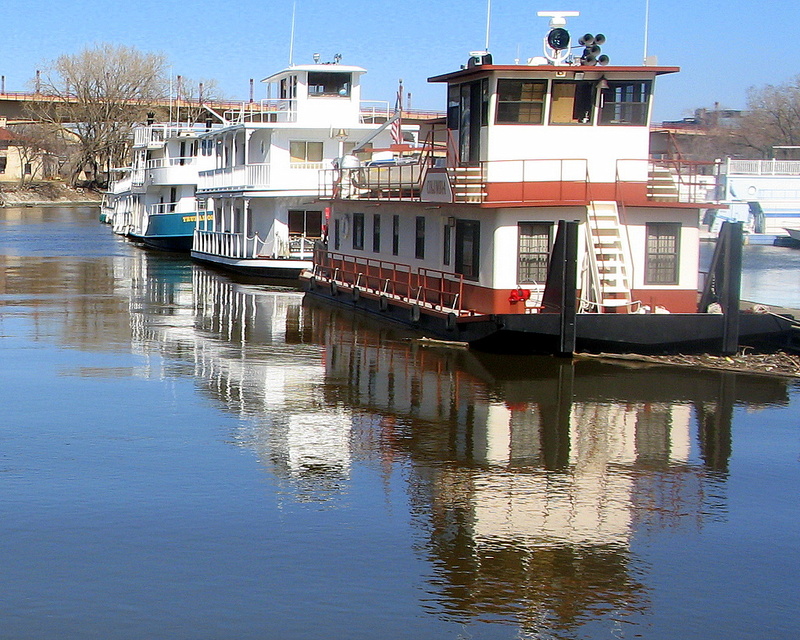 Just a few of the boats that were lined up on the Mississippi River, docked up by Harriot Island in St Paul. I would have liked to have had more of a clear reflection shot for this one, but the river waters and the wind was moving rather fast this day. I want to expand a bit off of yesterday's photo about the Lock and Damn number 2. It's a very interesting place to visit, I'm a short distance from the dam for this shot. 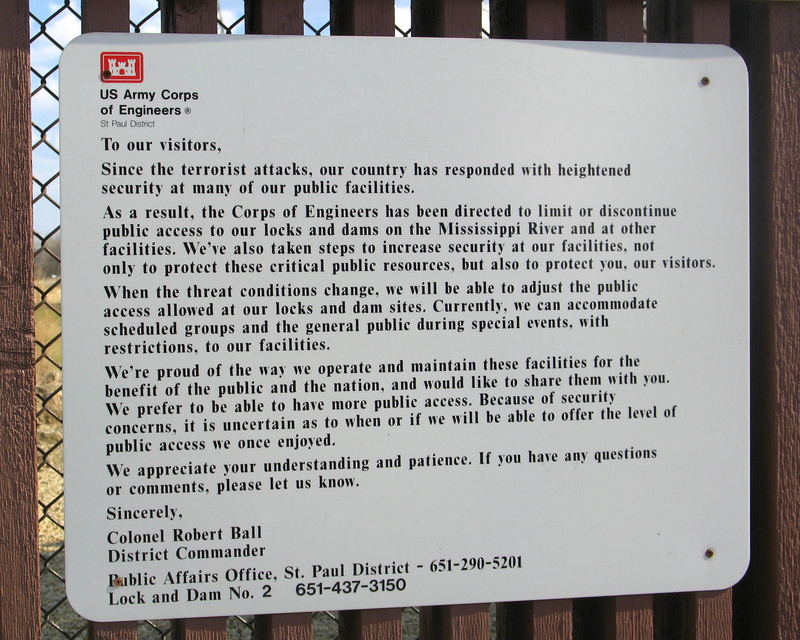 The bad news, if you read the sign on the closed entrance gate in yesterdays photo, the dam is closed for visitors. So, that is about as close as one can get to the dam and the observation platform. It does have to do with the terrorist attacks on September 11. Read the expanded warning message about why the dams are closed for the moment. 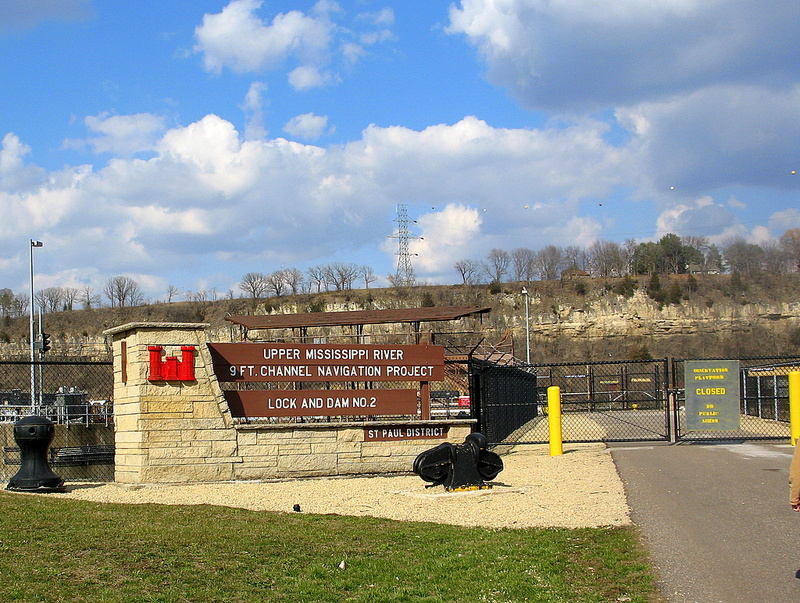 Payed a visit to Lock and Dam Number 2 which is located near the Hastings border on the Mississippi River. 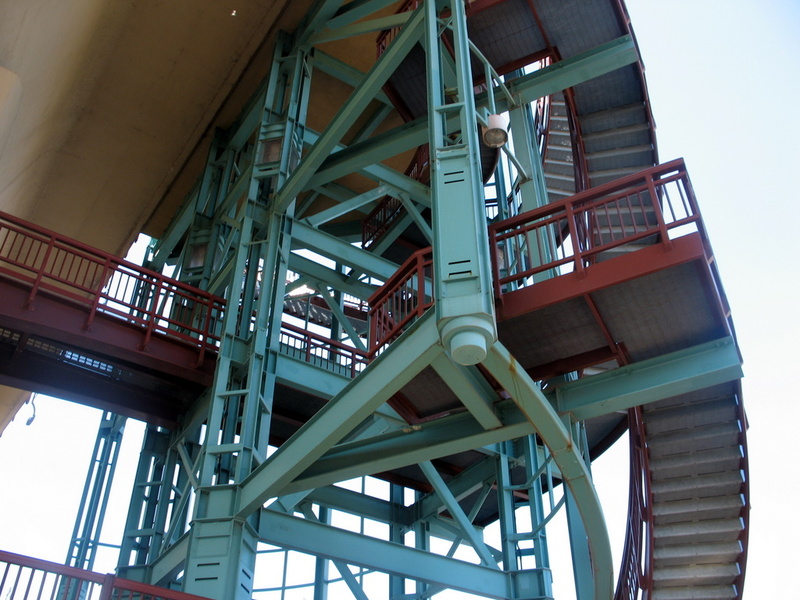 This is the entrance to the observation area which obviously leads to the area where you can watch the boats rise and fall, depending on which way they are headed. Snoopy in pinstripes, very fitting for this West Side neighborhood. 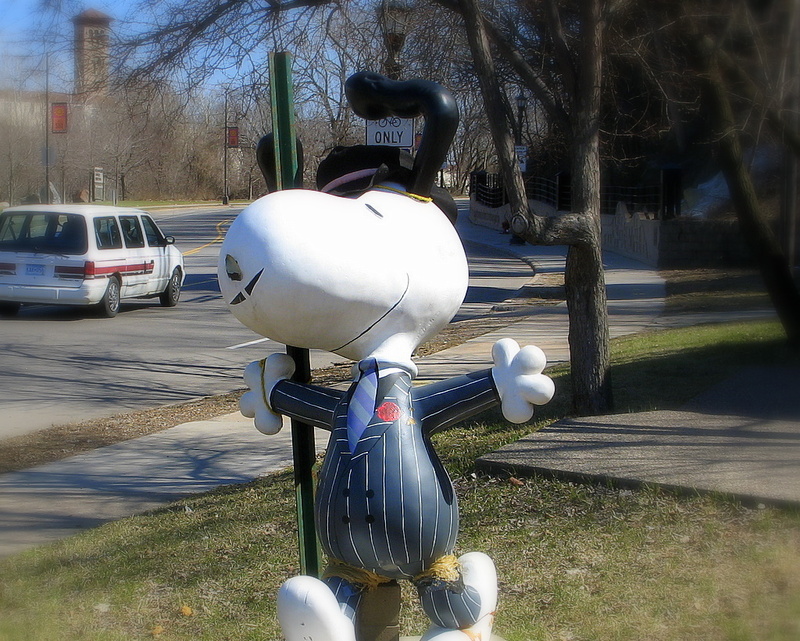 This snoopy is located on Wabasha Avenue near the green stairs. We had some very high wind speeds here in the Twin Cities today. The wind gust topped off around 60 miles per hour. The strange thing was, there was no rain in sight where I was. 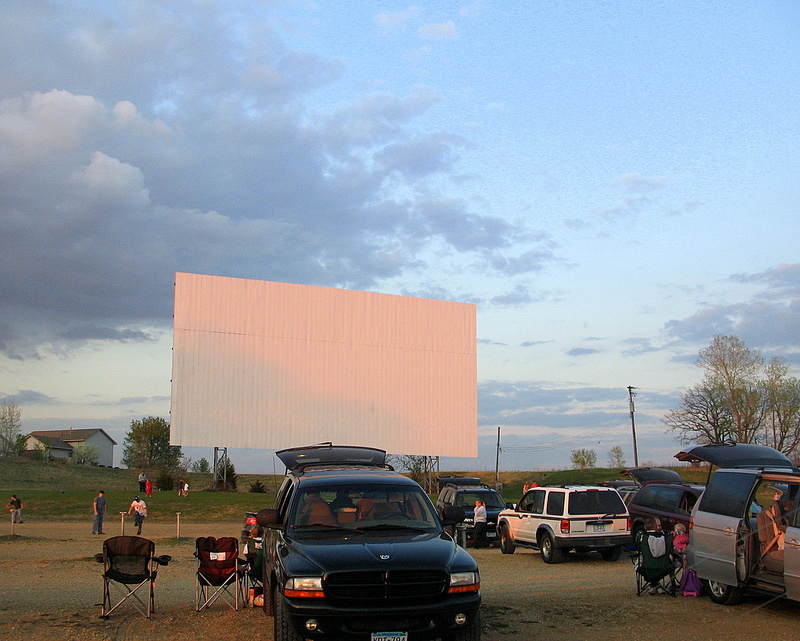 It was all winds, just like it was a severe thunderstorm, but lacking the rain. Lots of tree branches down, items blown over, found a couple new things that blew into my yard. For todays daily photo, I can only imagine what this large weather vane looked like during the wind storm today. 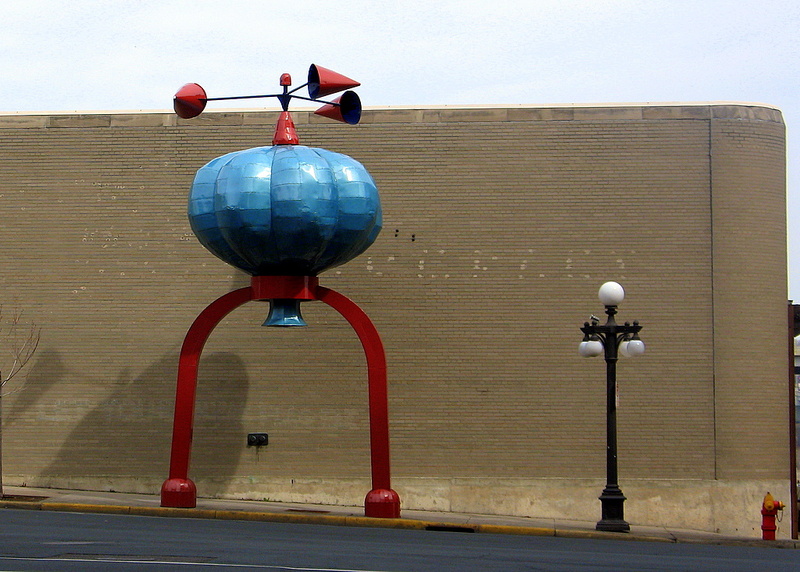 This unusual sized weather vane can be found in downtown St Paul right next to the farmers market. I left the light pole and the fire hydrant in the photo for size reference. 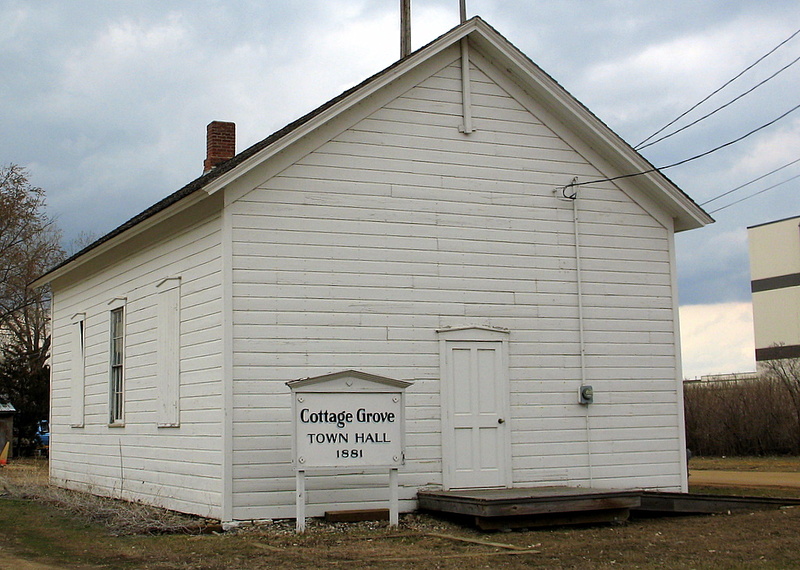 Currently being restored, the Town Hall of Cottage Grove served the cities government for 80 years. When it was built in 1881, it was located in the unincorporated village of Langdon. I'm looking for history on the Village of Langdon currently as I was unaware of this village name and how it became part of Cottage Grove. Photo of the Town Hall before the restoration. Very small photo but it was the only photo I could find. Oddly enough, it's nearly the exact angle I choose for my photo. Chris over at the Minneapolis Daily Photo has posted not one photo with a face, but two photos with a face. I felt compelled to keep up with the Jones, so to speak. I had taken this photo about three weeks ago in Hastings while on a walk with my family. 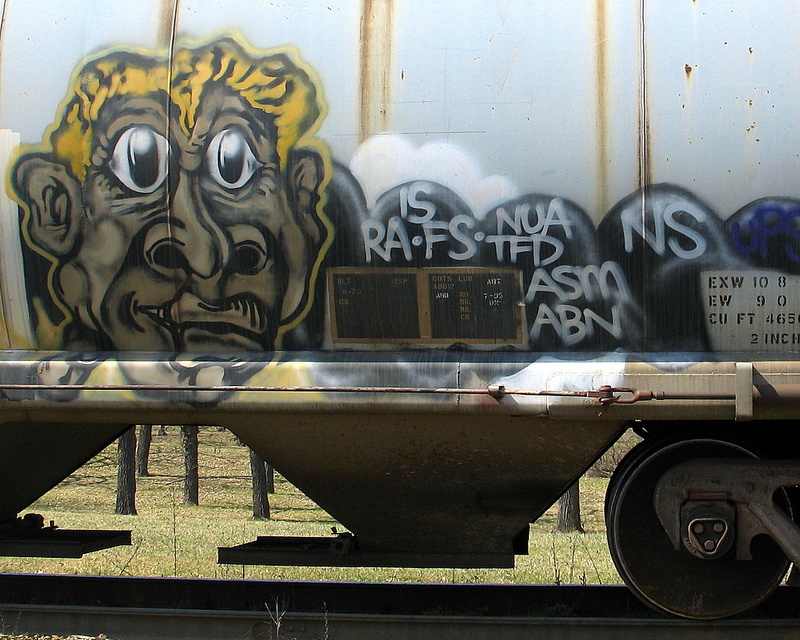 We happened to pass by this somewhat abandon train cars with lots of graffiti. After being challenged to a face off, I figured that this graffiti face was my answer to the surprise attack.